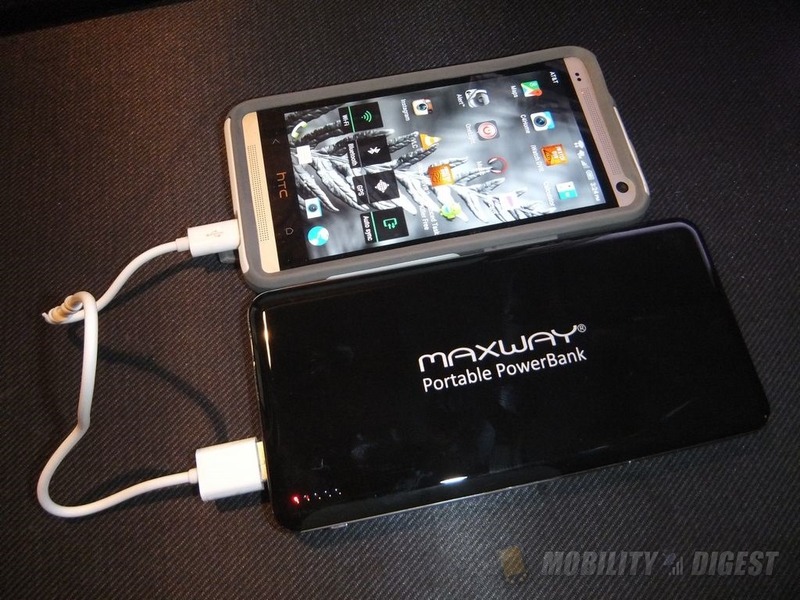 Maxway Portable Chargers are designed to maximize the battery life of your portable devices by providing them the most reliable backup power in a high efficient and smarter way. Built-in highly intelligent integrated circuit control system to achieve the input/output current stability, which makes it perfectly safe and worry-free to use this battery pack to charge your electronic devices. When charge this battery pack itself or use it to charge other electronic devices, after they are fully charged, the battery pack will be shut down automatically to avoid overcharge/over-discharge and therefore to save power and increase the efficiency of energy conversion. “PB-4B-MW” can charge iPhone (adapter NOT included) at least 6 times. It takes 10 hours to charge up this 12000mah battery pack with an usb wall adapter(NOT included). All batteries will discharge themselves gradually over time due to the fact that the electronic components on the circuit are consuming the power even when the power bank is not in use. Based on our tests,the electricity stored in this battery pack will only drop about 10% in 3 months. We use 3 pieces of 4200mah lithium-ion polymer batteries in this model, so in fact, the actual capacity is even higher than 12000mah! Meanwhile, Maxway battery packs also meet the highest safety standards and pass DGM inspections. Let’s start with a video then move on from there. 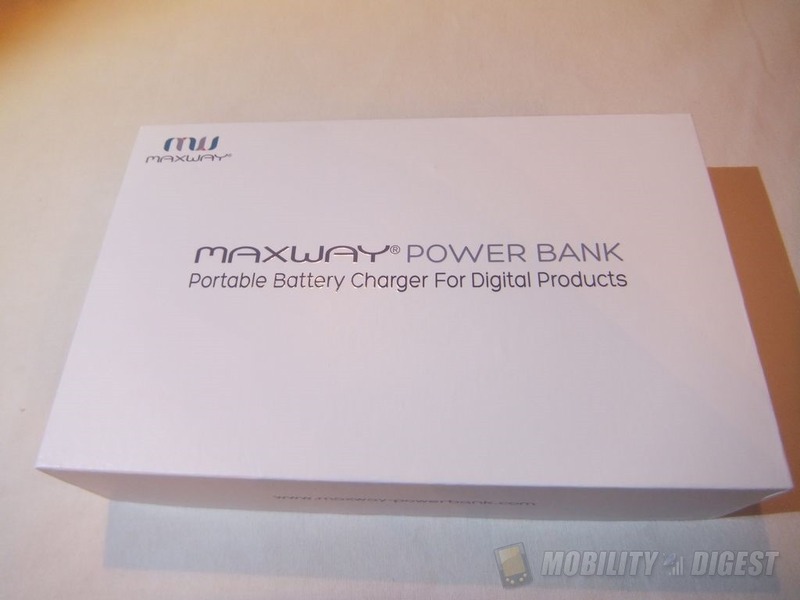 The packaging for the Maxway battery is nice, it’s more of almost a gift box style package. 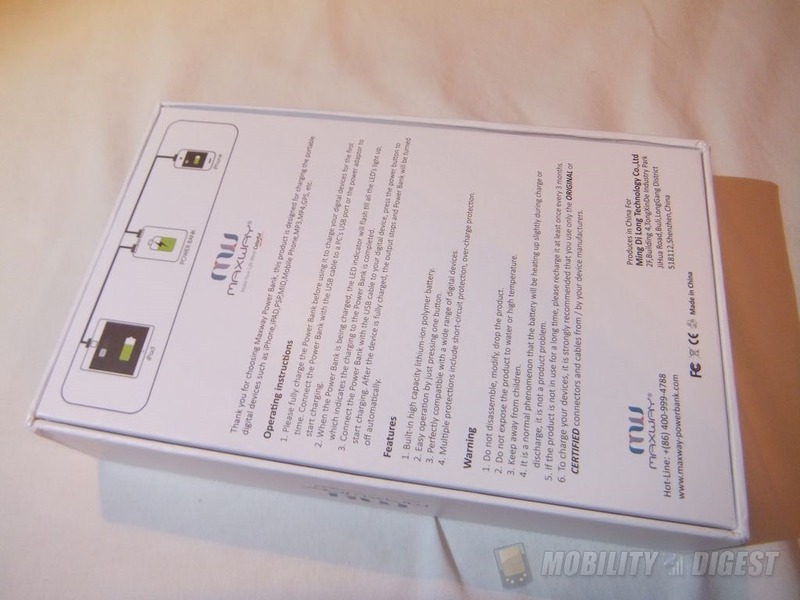 The back has specs and info and when you open it you’re greeted with the battery itself. Once you get everything unpacked you’ll find the battery, user guide, microUSB cable and drawstring cloth carrying bag. The battery itself is a bit large at 6.1 x 2.9 x 0.6 inches and it weighs about eight ounces. 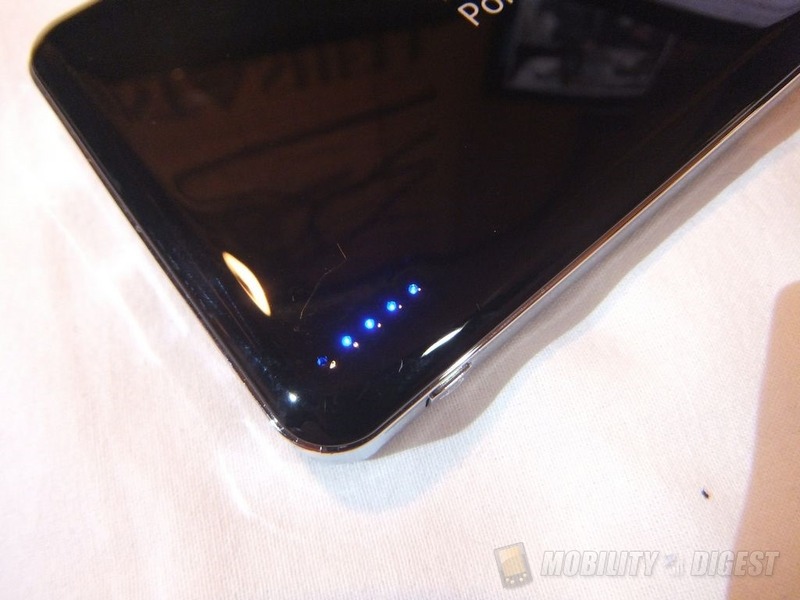 The battery has a very glossy finish to it that looks good but it will pick up smudges and fingerprints easily. The battery itself is a massive 12000mAh which means you’ll be able to charge most phones multiple times, or several devices once. The specs say it can charge an iPhone at least six times which is a lot of power. As a side note, inside are actually three 4200mAh batteries which means it’s more than 12000mAh in capacity. 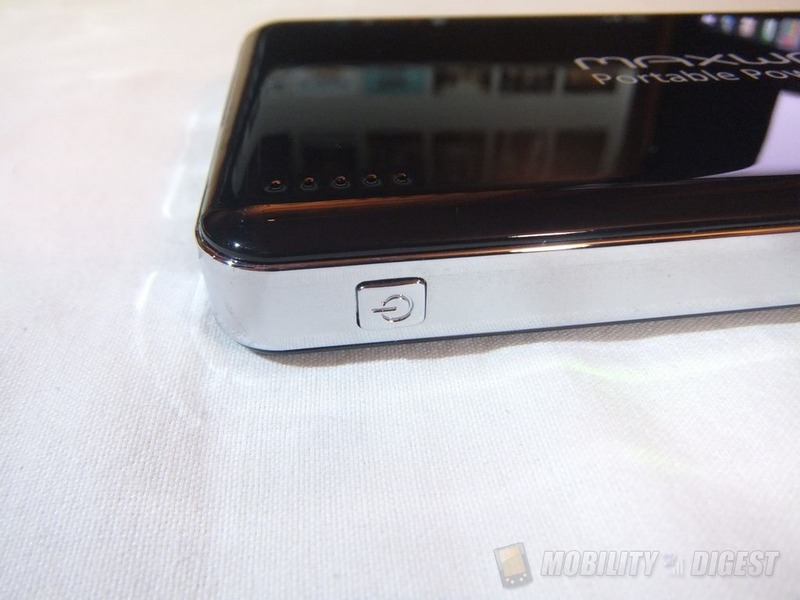 On the side is a small power button that’s used to check the battery level and to start the charging process. Yes you have to press the button to begin charging your devices. 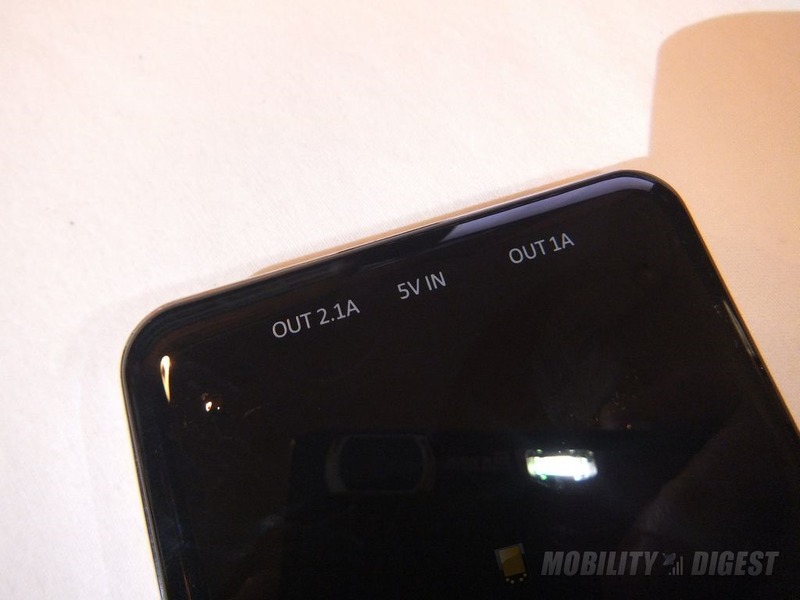 There are actually five LEDs located above the power button on the top. 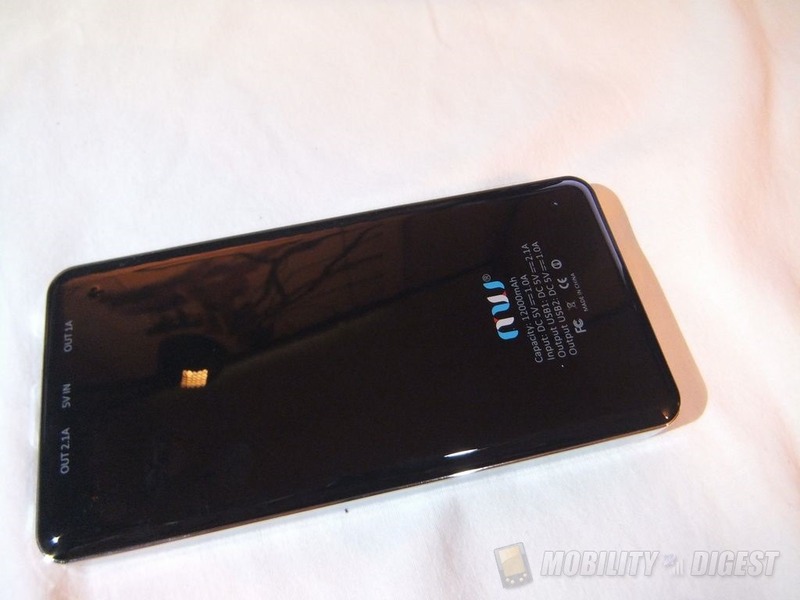 Four of them are blue and are the battery level indicators in 25% increments. The five LED lights up red to let you know the battery is providing power to what you’re charging. 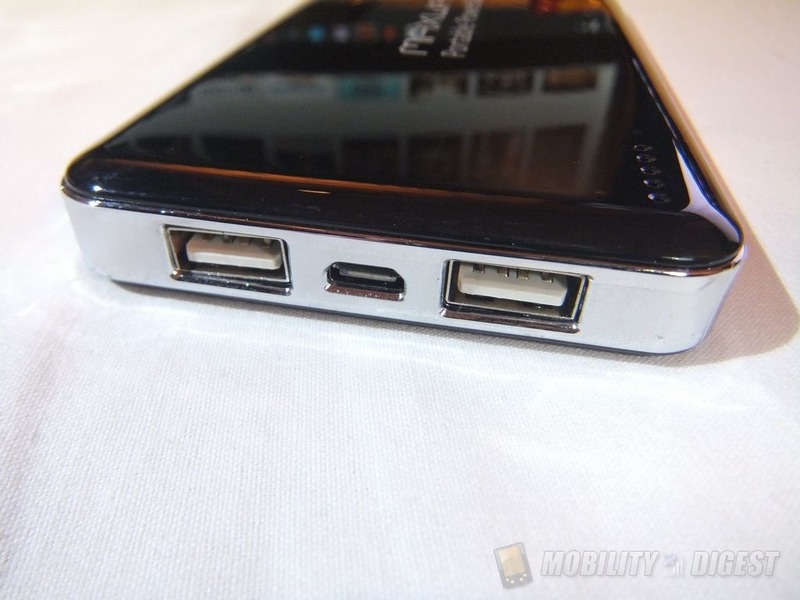 On the end are three UBS ports, two standard and one microUSB that is used to charge the battery itself. The two regular ports are 1amp and 2.1amp. On the bottom you’ll find the ID label and the labels for the USB ports so you know which is 1amp and which is 2.1amp. 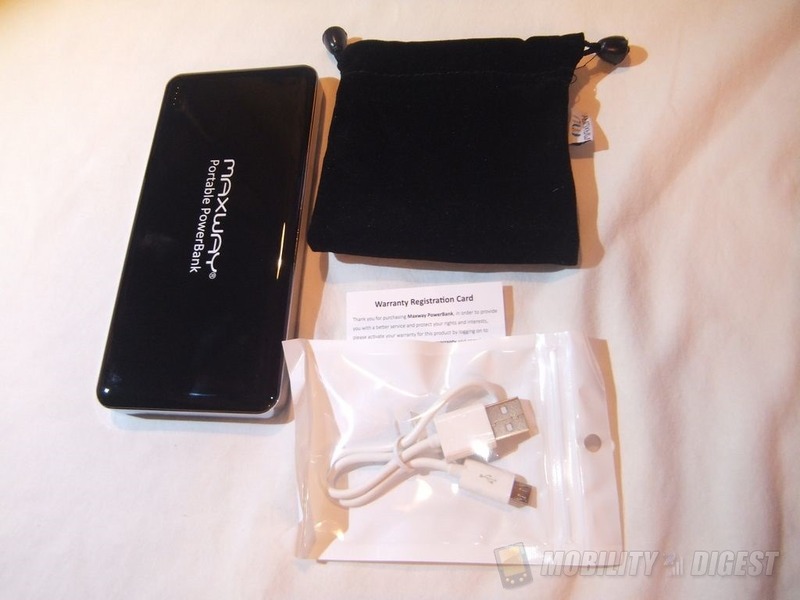 The first thing I did was charge the Maxway battery with the included microUSB cable. The battery was almost fully charged when it arrived so it didn’t take long to complete charging at all. 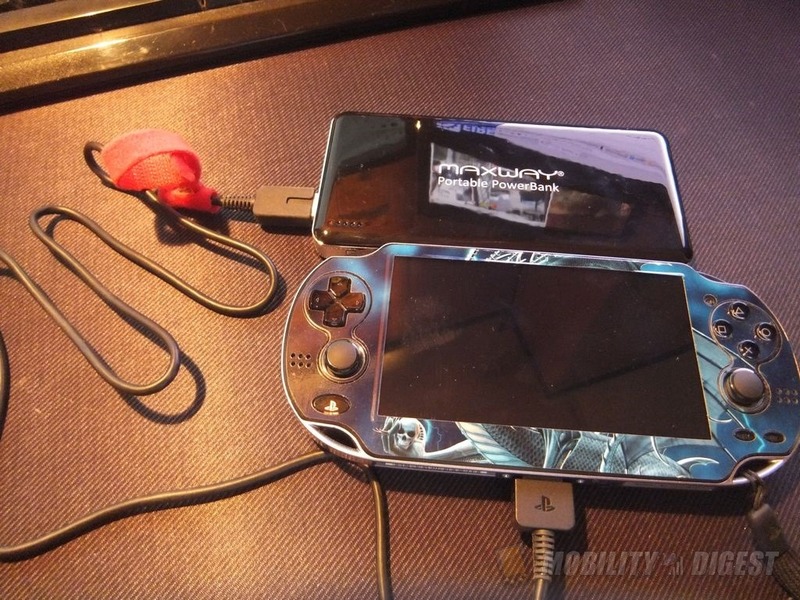 To test it I charged my HTC One M7 Android phone and my PS Vita and my Dragon Touch Windows tablet. I’m happy to report that it can charge the PS Vita, lots of these portable batteries can’t for whatever reason, but the Maxway can thankfully. Charging my phone worked fine, just like charging from my computer or the wall outlet. It did seem to charge my phone much faster that the USB from my computer though. I charged my tablet, phone and PS Vita a couple times each before I had to recharge the Maxway battery. 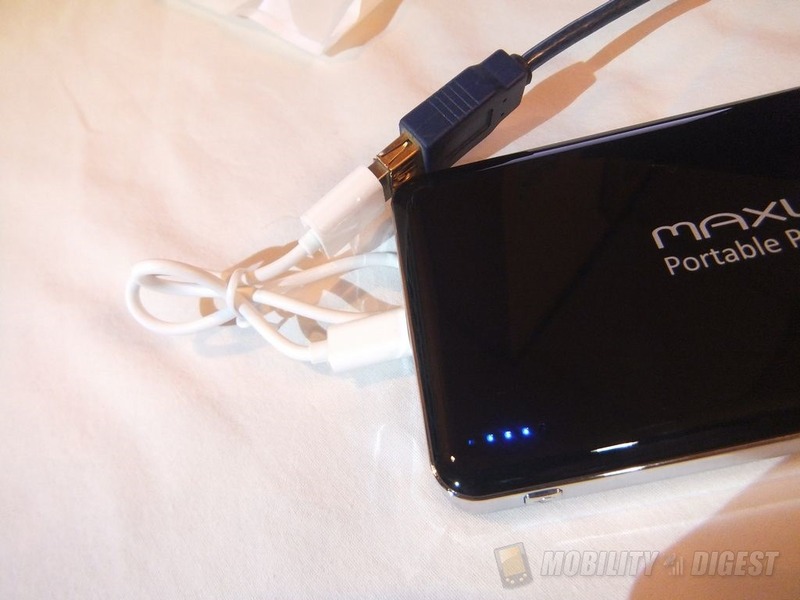 You can easily take this with you on a weekend trip and have more then enough power for the whole time for your phone and even other devices you might take with you. When charging the red LED lights up to let you know it’s working and the four blue LEDs don’t come on unless you press the power button to check the battery level. 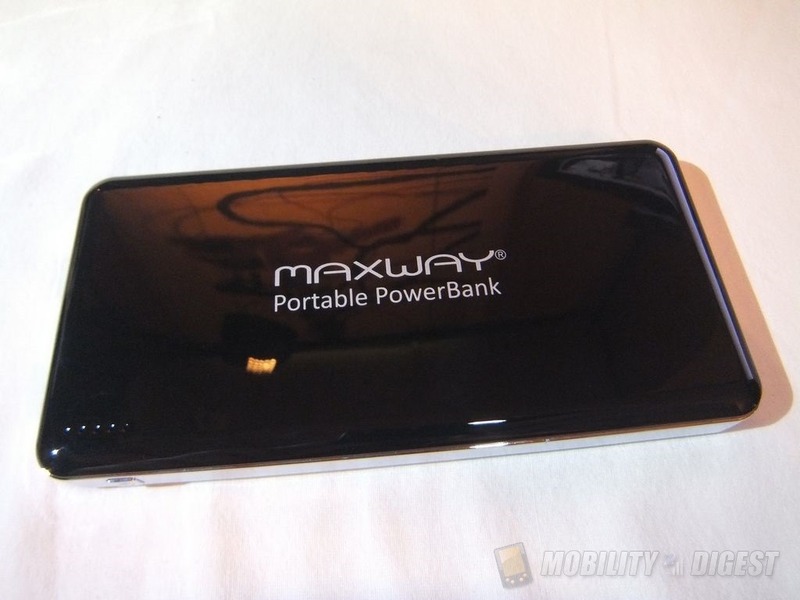 If you’re looking for lots of power on the go then the Maxway 12000mAh portable power bank is exactly what you want as it has more than enough power to charge most anything you’ve got. The 12000mAh battery can easily charge your phone multiple times or multiple devices and yes it can charge two devices at the same time. The battery is a large physically and rather heavy, but it’s a big battery so that’s to be expected. The only small issue I have with it is the finish, it’s glossy and it easily picks up dust, fingerprints and smudges. Use it once or twice and it doesn’t look very nice, it’s not shiny anymore, it’s just covered with smudges from your hands. Not a major problem, but I think companies should really think about functionality over looks. Sure the piano black glossy finish looks great when you open the box, but not long after that shine is gone. 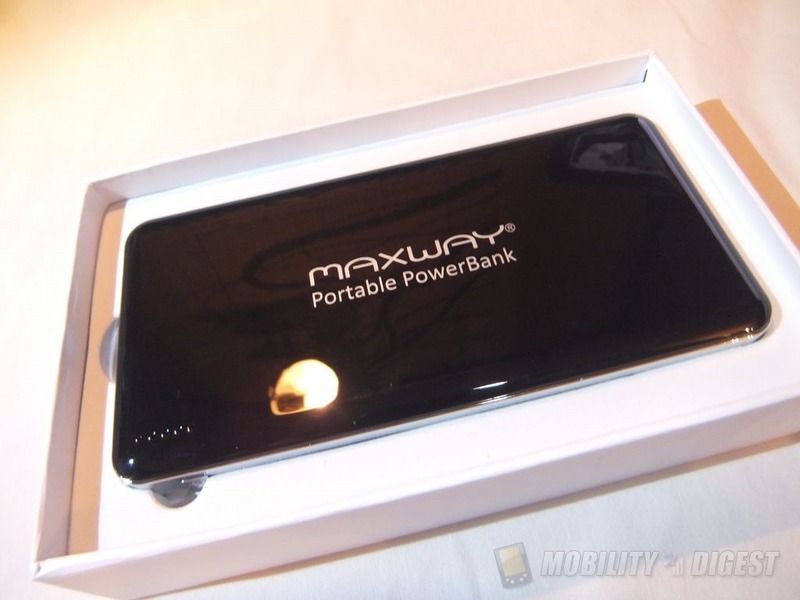 Overall the Maxway battery is decent product I think if you’re in the market for a large capacity power bank. This would be great to take with you camping or hiking or just on weekend getaway to make sure you’re got power when you need it. Next articleIs Google Killing Wonder?